Okay, this is awesome. 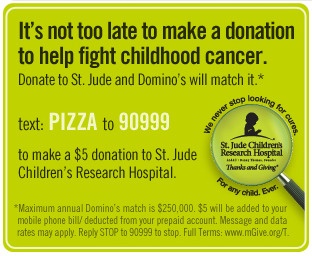 So, you text PIZZA to 90999 and make an instant $5 donation to St. Jude billed directly to your cell phone and Domino's will automatically match your donation with another $5. And you don't even have to order a pizza! Though I can see no earthly reason why you would not order a pizza. Pizza and philanthropy. Nirvana. Okay, and while we're talking about St. Jude, let me tell you a little more about them. You've all seen the infomercials. I myself have fallen victim to the mid-afternoon accidental channel surf stop and next thing I know I'm sponsoring a new wing. But I'm happy to do it. St. Jude Children's Research Hospital's mission is to find cures for children with cancer and other catastrophic diseases through research and treatment. St. Jude also covers the cost of food, travel and lodging for patients and a family member. Right now, you can take part in their Thanks and Giving campaign for the holidays. They have frillions of partners, each with some way to make a donation to St. Jude. For example, Pottery Barn will make a $5 donation to St. Jude with every $25 gift card purchase through Dec. 12. Williams Sonoma has a bunch of special products for which 50% of the profits will be donated to St. Jude. Old Navy will donate 5% of all gift card sales to benefit St. Jude up to $1 million. Check the partner website or ask when you go shopping to see what kind of donations your favorite stores will make to St. Jude! They also have a gift book with cutsie little items from which 100% of profits after related expenses goes toward St. Jude. So, at least some of your money for gifts will go toward a great cause. And, as always, you can simply make a donation in your name or in honor of someone else. news: "Nearly Six in Ten Plan to Give to Charity This Holiday Season, Survey Finds"
A story from the Philanthropy News Digest this morning gave us this tasty little nugget: "According to a survey by the American Red Cross, nearly six in ten Americans (57 percent) plan to donate to charity between Thanksgiving and the end of the year." While I wish it was 100%, at least it's a start. "Nearly Six in Ten Plan to Give to Charity This Holiday Season, Survey Finds"
news: "Be Liberal; Be Generous"
I am so grateful to be both a generous person (by my own estimation) and a liberal...especially after reading an article like this. Please take a moment today and read the following article by Paul Begala and see why it is SO important to help those less fortunate than ourselves. I've been a Kiva lender now for a couple of years and I love it. I started with a few modest investments (mostly as gifts for friends and family) which have ALL be 100% repaid. There has been some debate within the philanthropic and economic communities about the ethics of microlending in poor communities, but I have followed the reports about my investments carefully and have so far been quite satisfied. The awesome thing is that once a loan is repaid, the money goes back into your Kiva account so that you may re-lend it to someone else! (You can also take the money back for yourself, but I think that's a little cheap, don't you?) You can even give money in your account as a gift to someone for them to start their own Kiva account. I think it's awesome and a fun way to make a difference in someone's life on the other side of the world. 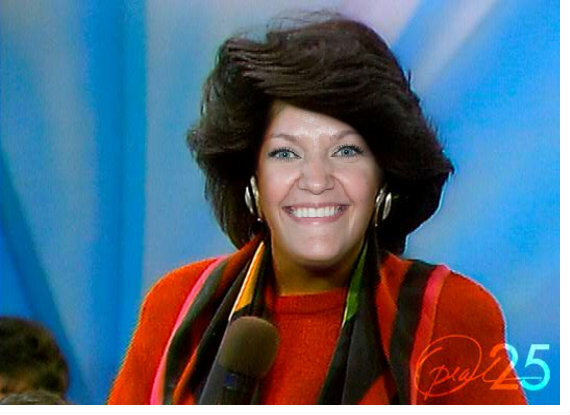 Oh yeah, and Oprah chose this as one of her Favorite Things, too. So...there you go. For Black Friday, millions of people will brave traffic jams and long lines for the latest gadgets, deals and thrills. Just imagine if you could just stay in your stretchy-waistband pj's and do all your shopping from home buying gifts that would help end hunger and poverty! Well, you can. Okay, I love Heifer and I have given many people gifts from this organization, which is why I chose it for my first posting. The coolest thing about Heifer is the gift catalog. You can literally to choose to buy on someone's behalf a pig or a goat or "Joy to the World." I want Joy to the World for Christmas! Who doesn't want Joy to the World for Christmas? (Okay, I can think of a few people, but that is for a different blog). I once got my stepdad a goat from Heifer International. I thought that was really cool. A Heifer International donation is a meaningful gift for someone that helps children and families around the world receive training and animal gifts that help them become self-reliant. And once you've chosen your donation, you can create a printable gift card or e-card to let the recipient which Heifer gift you've chosen for them. Now go get you some Joy to the World. news: "When Donations Go Astray"
This here NY Times article - while not all-encompassing - is real informative about choosing good charities. Please for you to check it out. Oprah, eat your heart out. WAIT! Stop eating. That was a euphemism. But, seriously, folks. Let's talk about the holidays, shall we? It's a time for giving. A time for spending. A time for junk and sales and paper and waste and... EERRRR! That's not the spirit. And yet, it is. We spend way too much time and way too much money commercializing the holiday season...including yours truly. I don't deny the fun and joy and sparkly pleasure of a big pile of crinkly paper and the beeps and whirrs and clicks of shiny new toys. I am, after all, American. But I am launching a new initiative this holiday season to get everyone to make one tiny little addition to their Christmas giving lists this year. And allow me to also point out the ridiculous ease and speed of giving donations as it takes mere moments and can be done the same morning you realize you are leaving and you don't have a gift for your cousin you'll be seeing that afternoon that you just found out got a gift for you. Problem solved. And if you must buy gifts, buy responsibly! There are tons of stores out there that will donate part of the proceeds of their sales or will chip in a donation to an organization with your purchase. If you do a little peekin' 'round the innernets you will find hundreds of charities and organizations that want your money. STAY! Do not run away. I can help you. It's easy to choose a charity if you know what YOU care about. I will be posting to this here site helpful tips about how to choose a good charity and some helpful suggestions of charities, orgs, and stores that I like. Hopefully you will trust me enough to let me guide you through the giving process and then you can go off on your merry way toward making the world a better place, one reclaimed paper bracelet at a time. Please also feel free to comment, email, Facebook or Tweet me ideas for this here blog. Many thanks. And now, back to your turkey hangovers. Happy Thanks-GIVING, all.